One of the sought-after carburation systems for the early Chevy is the famous “348" tri-power. Deciding to build a 1958-1961 tri-power car is easy; finding and collecting the parts is another story. Many members don’t even know what to look for at swap meets. This article is intended to help those of you who want to build a 348 tri-power. It is said that “a single picture is worth 1,000 words!” Well, here is a “37,000 word” article to help you with your 348 tri-power quest! There has been some confusion as to what motor is correct for a specific 1955/1956/1957 car because up until now, nothing has been published on identifying the correct motors. Another reason for the problem is that all of the motors listed in Table #1 will bolt into place on any passenger car firewall and function properly. So, when someone needed another wiper motor, or wanted to change from vacuum to electric, they simply unbolted the "old" and replaced it with one of those listed. 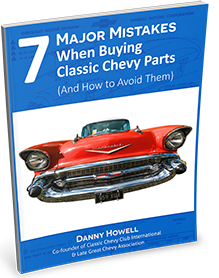 This Tech Check article will help those of you who are looking for the correct steering wheel and horn ring combination for your Southeast Chevy (1958-1964). It includes photos and excerpts out of GM’s “Passenger Car Engineering Features” manuals. I have taken quotes out of the manuals describing the steering wheels and horn ring combinations. (Only the full-size passenger cars will be covered in this article.) In this article, the term steering wheel is referring to the painted part, not the complete assembly, which includes the horn ring and cap. In general, there are three steering wheel/horn ring sets for each year. In most cases, the two less expensive series (Bel Airs and Biscaynes) used the same steering wheel with the horn ring or horn cap being the piece that was different between the two. The and 1960 steering wheel assemblies are identical. This week's Tech Check article will help you identify the different wheels on 1955-1964 Chevrolet passenger cars. With this article you will have the data and photos to identify the wheels you need for your project. There are a total of 8 different wheels for these years. The 1963 models were the only model year to have four different wheels. Early 1963 model wheels were the same as the 1962 wheels. Later 1963 model wheels were the same as the 1964 wheels. There are at least two photos of every wheel that should help you identify a wheel. Have you ever wandered around a swap meet looking for wheel covers? You’re not sure what they look like, but you saw them some time ago on a car and now you want the same thing for your Chevy. As you make your way down the rows of people, you come across a person who has a lot of wheel covers. You stand there in total amazement looking at all those covers, you wonder how any one person could have come across so many of these chrome dish shape objects. The excitement of the hunt has your blood flowing. You immediately ask the owner of these chrome wonders if he has any of these special wheel covers to fit your particular car. The salesperson replies back to you that he is sorry, but he does not know what they look like and points you to a stack of Chevrolet wheel covers. Spotlight: 1962 Impala "Jet Smooth Chevrolet"
The Impala continued its rapid progression in ’62 with a model more angular than the previous years. All of the models, excluding the 4-door hardtop, now featured “C” pillar styling. This new “convertible roof” styling was sensational and proved to be very successful. Because of this, ’62-’64 Impalas became popular collector cars.